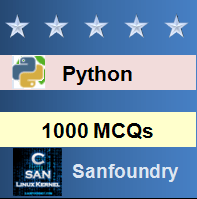 This set of Python Multiple Choice Questions & Answers (MCQs) focuses on “Global vs Local Variables – 1”. Explanation: In the code shown above, x=15 is a local variable whereas x=12 is a global variable. Preference is given to local variable over global variable. Hence the output of the code shown above is 15. Explanation: The variable x is a local variable. It is first printed and then modified. Hence the output of this code is 100. Explanation: The value passed to the function san() is 12. This value is incremented by one and printed. Hence the output of the code shown above is 13. Explanation: At the time of leader processing, the value of ‘x’ is 12. It is not modified later. The value passed to the function f1 is 4. Hence the output of the code shown above is 4 12. Explanation: In the code shown above, the integer 2 is appended to the list [3,4]. Hence the output of the code is [3,4,2]. Both the variables a and b are local variables. Explanation: The error will be caused due to the statement f1(1) because the function is nested. If f1(1) had been called inside the function, the output would have been different and there would be no error. Explanation: In the code shown above, the variable ‘x’ has been declared as a global variable under both the functions f1 and f2. The value returned is a+b+x = 1+2+4 = 7. 12. What is the output of the code shown below? Explanation: The output of the code shown above is 100. This is because the variable ‘x’ has been declared as global within the functions f1 and f2. Explanation: In the code shown above, x, y and z are global variables inside the function f. y and z are global because they are not assigned in the function. x is a global variable because it is explicitly specified so in the code. Hence, x, y and z are global variables.